Thomas J. Long School of Pharmacy and Health Sciences. Mulder received his Bachelor of Science in Biochemistry from the University of California, Davis and is currently a first year student in the Doctor of Pharmacy program. After initially working several years in basic research, he had the unique opportunity to join several engineering colleagues at a start-up company in the Silicon Valley. This sparked his interest in integrating emerging technologies in the field of pharmacy. During hard economic times like these patients are seeking low-cost, over-the-counter (OTC) products for self-treatment in lieu of visiting a doctor. “When used correctly, OTC products offer effective self-treatment options, but if used incorrectly OTC products can put vulnerable groups such as small children and the elderly, who are on multiple medications, at greater risk of worsening health problems,” said Mulder. With this grant, Mulder, under the guidance of faculty advisor Dr. Suzanne Galal, will be conducting a pilot study to investigate the effectiveness of a unique patient education and technology-based intervention for self-treatment. If designed properly, the system can perform “intelligent” tasks similar to those performed by a pharmacist counseling patients on OTC product usage. This “expert” system will run on an Artificial Neural Network (ANN), a powerful machine learning method that is able to capture and represent complex input/output relationships. Once the patient has identified his symptoms, the system generates recommended treatment options based on the knowledge. Mulder is also taking it to the next level by designing the device to offer multiple languages according to patients’ preferences, as well as ensuring a standard minimal grade four reading level. Mulder hopes the enhanced accessibility of the kiosk-based OTC device will improve patients’ ability to understand, communicate and use health information to make smarter, self-treatment choices when purchasing OTC medications. In addition, he hopes the device will serve as a viable educational resource and tool for the School for OTC counseling, training and outreach events and health fairs. Mulder is currently in the process of submitting the OTC device and methodology for patenting. As a recipient of this grant, he will be participating in the Innovation Learning Community (ILC) over the next year to support future grant recipients and their innovations. Mulder will be completing his study later this year and plans to make a final report presentation in April 2012. The National Student Speech-Hearing Language Association (NSSHLA) Pacific Chapter was created to serve both undergraduate and graduate students. Under the leadership of co-presidents Nicholaus Brock ‘12 and Lizette Lopez ‘12, NSSHLA is making a strong comeback after many years of being dormant. NSSHLA’s undergraduate executive board includes co-presidents, fundraiser chair, secretary, co-financial chairs, public relations representatives, and membership chair. Graduate students are also represented on the board by a historian, membership chair, and fundraiser chair representing the graduate students. Eighty members strong, NSSHLA is a frequent volunteer with the Very Special People Bowling program, organizing and participating in the School’s Annual Golf Classic Scholarship Tournament, hosting Welcome Dinners for students, faculty, alumni, and staff, and helping improve literacy in the Stockton community. In 2010, NSSHLA hosted therapy demonstration and hearing screenings at the University’s Pacific Alumni Weekend. Hearing screenings were provided to nearly 50 alumni. Last fall, the student speech-language pathologists partnered with Nikaya Handcrafted, a Truckee-based company that specializes in home decor, fashion and lifestyle accessories, to raise more than $400 for Cambodia by selling jewelery, bags, and scarves that were all handmade in Cambodia. 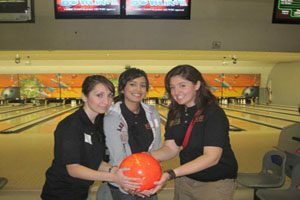 On April 14, 2011 NSSHLA hosted a successful Karaoke Night at the AVE, a restaurant located on the Miracle Mile, raising more than $700 to support local speech-language clinics. Many students, faculty, staff, and alumni came out to join in on dancing, eating, singing, and fun. “I learned how to make connections with local businesses in order to find support for our speech-language clinics. Seeing the local SLP (Speech-Language Pathology) community come together and donate to the Scottish Rite Language Center was most rewarding,” commented Brock. As a group, NSSHLA attended the continuing education program Literacy & Communications Disorders at the California State University, San Francisco on April 16, 2011. Student speech-language pathologists are making solid representation at national meetings with high attendance from each class and poster presentations by current students and alumni. This year Norma Gonzalez ’09 ’11 and Mary Xiong ’10 ’11 presented posters at the California Speech-Hearing Association meeting. You can support the student speech-language pathologists at their events as they continue to make a difference in patients’ lives and in the community. Learn more about NSSHLA and what students like them are doing by visiting www.nsslha.org. Daniel T. Huynh ’13 was recently named as one of 27 recipients of the American Association for Cancer Research Center’s (AACR) Thomas J. Bardos Science Education Award for Undergraduate Students. Huynh received this award in 2010 and was officially recognized at the AACR 102nd Annual Meeting 2011 in April. “I am very blessed to be acknowledged for my research. This award means a lot to me. There is a lot of great research being done in cancer and to have mine being mentioned in the same sentence is truly a humbling experience,” says Huynh. The award, which is meant to inspire undergraduate science students to enter the field of cancer research, is a two-year award that provides a unique educational opportunity for students in the development of their careers in science. 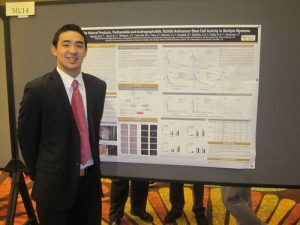 In addition to the free registration for AACR Annual Meetings and a $1,500 stipend for expenses associated with attending the meetings and related school projects, this recognition gave Huynh the opportunity to enter the undergraduate poster presentation competition in which he placed second. He also won the Gary J. Miller award for biomedical research. Huynh is also a volunteer for Camp Ronald McDonald for Good Times which strives to create a positive long-lasting impact on children with cancer and their families by providing fun-filled, medically supervised, cost-free, year-round camp programs. At the annual meeting in April, Huynh presented his research on The natural products, parthenolide and andrographolide exhibit anti-cancer stem cell activity in multiple myeloma. “This experience has not only made me become a better basic scientist, but also a better healthcare provider,” commented Huynh.